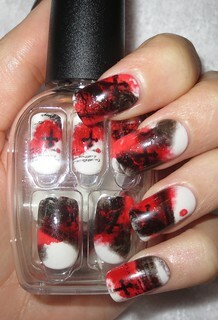 Today I have the perfect nails to go along with any creepy costume this Halloween! ImPress has released a few new designs to their Press-On Manicure line for Halloween, and today I have the design called Broomstick* ($10.99 CAD) to share with you! Each kit includes 24 nails, so you're definitely able to get two uses out of one set, or share it with a friend.I found that the kit contains a wide variety of nail sizes, and I was able to find ones to fit all of my nails. 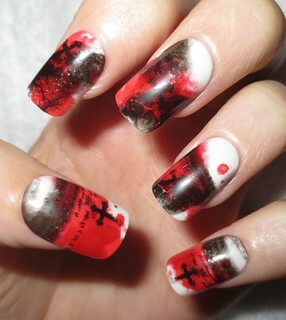 To apply, you simply peel off the sticker from the bottoms of the nails, and apply to your nail. The side with the tab is to be applied to the cuticle. Application from start to finish only took me about five minutes, which I thought was amazing! When I use nail stickers, it takes me at least a half hour, since you need to file them down. The Broomstick pattern is a really creepy bloody design that would pair perfectly with almost any scary or creepy Halloween costume. I find that the ImPress line stays on my nails for at least a week, I absolutely love them! These are easy to both apply and remove, and I think that anyone would have success with these. This looks fantastic!!! :D Happy Hallowe'en! !